With the latest release of Hyper-V, Microsoft has made some great improvements to their Hypervisor. For many reasons, Hyper-V has become a major player in virtualization. In this article, Nicolas Prigent describes new Hyper-V updates and enhanced Hyper-V features that were introduced with Windows 10 and Windows Server 2016. Microsoft offers a ‘feature update’ to Windows 10 every six months, and continues to unify its Windows development and deliver new features. Microsoft’s next major update for Windows 10 is at its last phase of development and is planned for a September release with the Windows 10 Fall Creator Update. In mid-June, Microsoft announced a major change to how it will deliver new releases of Windows Server. Microsoft will now move to a semi-annual cycle. This new release cadence, which is similar to what Microsoft is doing with Windows 10, will allow every company to take advantage of new innovations. Technology is moving so fast so that sysadmins must be aware of every new feature and update those that are already released. This article will be focused on Hyper-V and especially all the new changes in Windows 10 and Windows Server 2016. 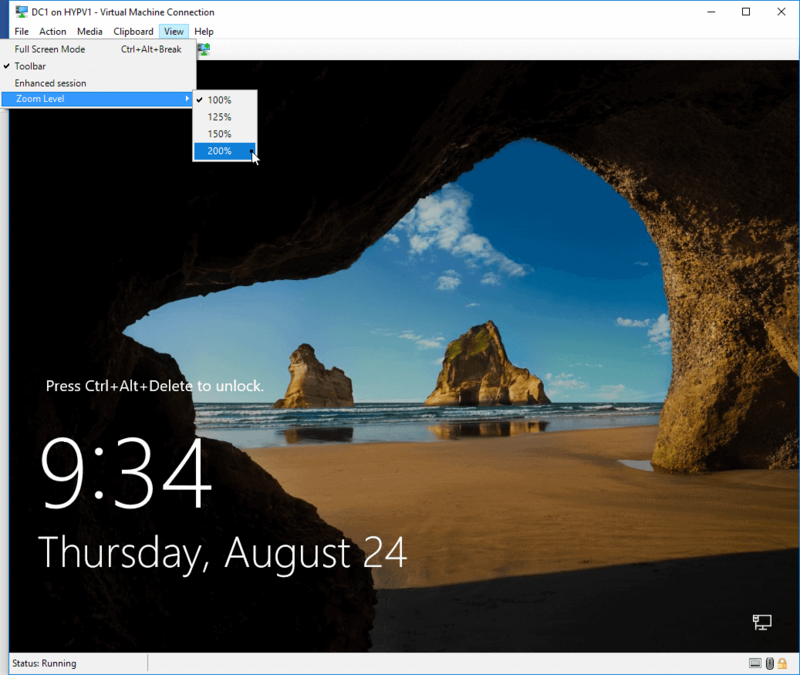 The next major update to Windows 10 comes with many improvements, including enhanced Hyper-V changes as well. So let’s review these changes and start with one of my favorites. Quick Create is a single-page wizard that let you create a virtual machine in few seconds. The single-page wizard is quite unlike the traditional ‘next-next-next’ wizard. These traditional wizards offer a lot of options but sometimes you just need to create a basic Virtual Machine quickly for testing an application. Now, you can use the Quick Create option for this sort of job. 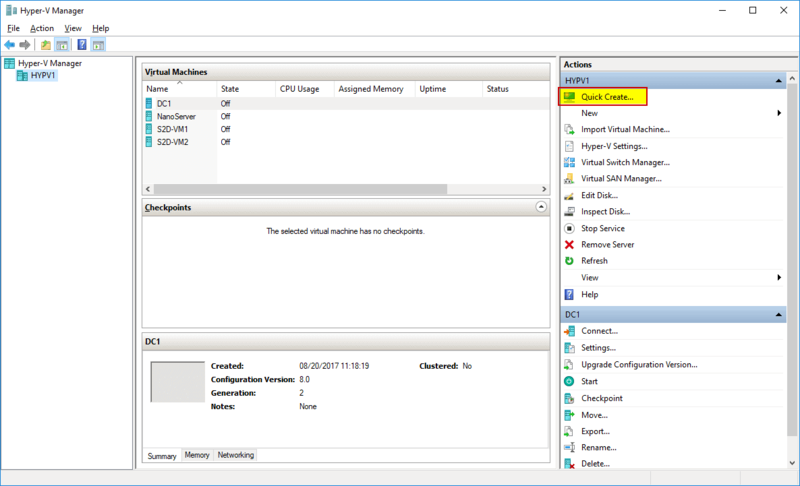 Open the Hyper-V Manager and click “Quick Create” in the Actions panel. If successful, the results screen should display information with the options to Connect or to Edit settings to customize the virtual machine before you continue. Have you ever wondered why the VMConnect window could not be resized? Well, the enigma is over! You can now resize the display for a session in VMConnect just by dragging the corner of the window. There is just one requirement for dynamic resizing to work: you must be running in enhanced session mode. Microsoft had introduced Nested Virtualization. 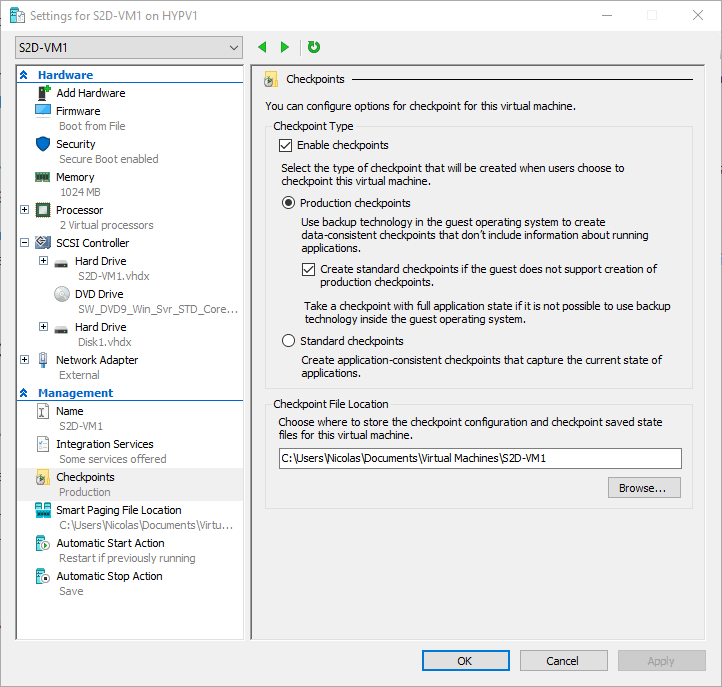 Nested virtualization lets us create Hyper-V virtual machines inside another Hyper-V virtual machine (or Hyper-V host). A common problem was that Hyper-V did not support the virtual hosts being put into a saved state or being saved to a checkpoint. Microsoft has solved this problem in the latest update and we can now take checkpoints and saved states in a Virtual Machine which is acting as a Nested Hyper-V hosts. Here is a gadget, but for some people it can be very useful. Under the View menu in VMConnect, you will find a new Zoom option. You now have the option for adjusting the Zoom Level if you can’t read something in your Virtual Machine. This can be helpful on high-resolution devices. Note that you must disable the “Enhanced Session” option before using the Zoom level option. Hyper-V used to allocate memory in a conservative manner, which is a good idea but some developers faced out-of-memory errors. In the Creator Update, you can now allocate all the memory to be used. This means that you run the risk of running out of memory on the host, so Hyper-V administrators must be careful. What’s new in Build 16226 for Windows 10? When the compression is done, you will be able to copy and paste this file on another machine or server. Then, the only thing to do is to double click this file on your destination machine to start the import process. In the background, the utility called “C:\Program Files\Hyper-V\vmimport.exe” will be used. It is a very simple process to export a virtual machine, which can help you to backup a virtual machine! Let’s see the new Hyper-V features on Windows Server 2016. 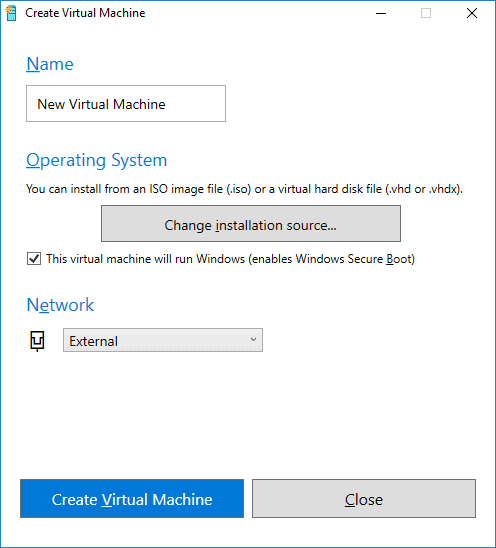 Creating a virtual machine within a virtual machine was previously just a theoretical concept. With Windows Server 2016, you can run Hyper-V virtual machines inside another Hyper-V virtual machine. You will need a processor with Intel VT-x in order to use Nested Virtualization. Below is a screenshot from Ben Armstrong’s Virtualization Blog: https://blogs.msdn.microsoft.com/virtual_pc_guy/2015/10/13/nested-virtualization-in-windows-10-build-10565/. Microsoft introduced a new ‘Production Checkpoints’ feature in Windows Server 2016. Production Checkpoints are based on backup technologies inside the virtual machine instead of creating a saved state. For Windows guest OSs, the Volume Snapshot Service is used; and it ensures data on disk is in an application-consistent state via a VSS snapshot, the same state as if a backup had been taken. In Hyper-V 2016, Production checkpoints are set by default. Standard checkpoints are set only if production checkpoints cannot be created. Standard Checkpoints capture the state, data, and hardware configuration of a running virtual machine. With these screenshots, you will probably understand this new feature better! You can now easily upgrade your nodes without any downtime! You just have to pause one node, evicted the node from the cluster, upgrade it to 2016 and re-add it to the cluster. Do that for each node and your cluster will be upgraded smoothly. The big advantages are that you don’t need to create a new cluster because you can upgrade your existing cluster and the cluster does not need to be stopped or restarted. Data protection is a fundamental requirement for every virtualization platform. If a virtual machine file can be copied or moved offsite, then the virtual machine can be run on any other system. To avoid this security issue, Windows Server brings a new feature which is called Shielded VMs. It allows you to restrict access to Hyper-V guests so that they cannot be accessed by Hyper-V administrators. It means that Hyper-V administrator cannot access a Shielded VM content, unless this administrator has explicit permission to do so. Shielded VMs work with TPM module by providing the strongest possible protection. You will need to configure your “ClusterGroupSet”. A set is a group of virtual machine with the same role that you can, of course, configure with PowerShell. 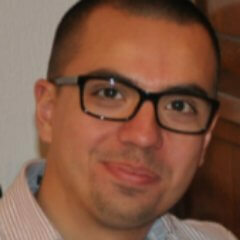 You must import the Failover Clusters PowerShell module. Containers do not contain any operating system, so they take up fewer resources than virtual machines on the physical host. Containers simply share the host operating system, including the kernel and libraries, so they don’t need to boot a full OS. 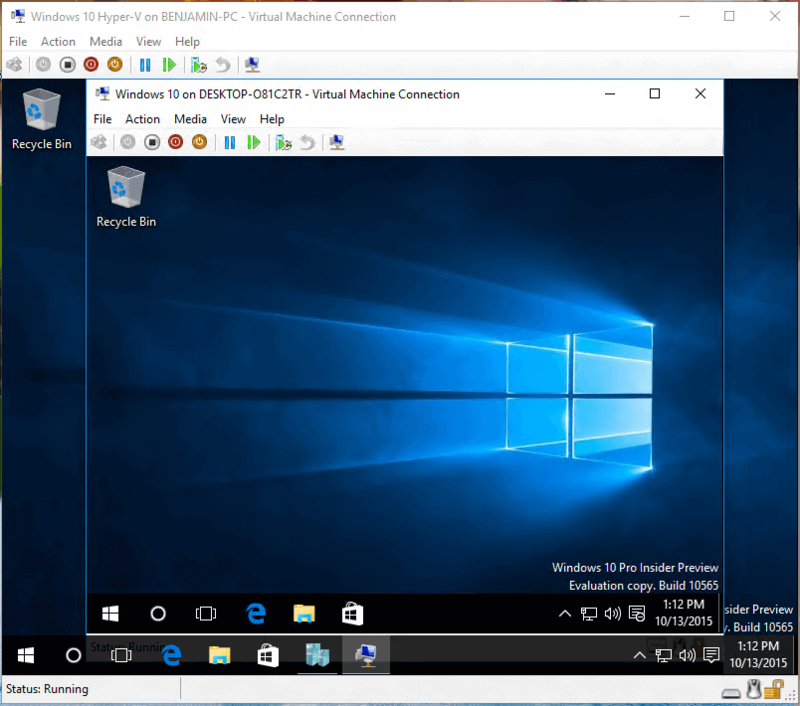 The use of Hyper-V in Windows 10 works very well, and usefully, in demo, test, and training environments. It allows you to run a complex deployment that allows to perform a range of tasks such as testing clusters, storage spaces direct and Windows Containers. Most of the limitations are now to do with memory and storage. Some of these new changes will be covered in future articles on Simple-Talk.